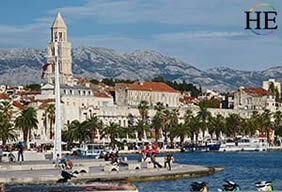 Explore the gorgeous South Adriatic Sea and islands with HE Travel. 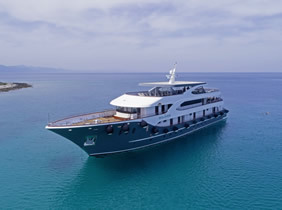 We’ll cruise aboard our partner’s comfortable 39 passenger yacht Solaris. Beginning in Dubrovnik, we make our way to several remote islands, including Mljet, Korcula, Hvar, and Brac. The views are stunning from the boat and from the land. While ashore, our group will bike through countryside vineyards and sip on the local wines. We’ll have time to stroll through the port towns, and peek inside old-world shops. We’ll explore the islands by foot, kayaks, and bicycles to give us the local perspective of these quaint island towns. When we rejoin our yacht, don’t forget to take a dip in the Adriatic Sea’s refreshing cool blue water, before continuing the magic of Croatian Cruising. Croatia is the Mediterranean destination to see – with its blend of great food and delicious wine, its rugged and dramatic Adriatic coastline, the translucent purity of its sea, and the generally easygoing attitude of the locals themselves. These pearls of the South Adriatic will leave you with an abundance of memories as we visit Dubrovnik, the lakes of Mljet island, Golden Cape and the most beautiful beach located on Brac Island. It is had to believe that this country was once a war zone almost two decades ago. Croatia is a well established safe, independent and tourist-friendly country. We arrive in Dubrovnik, one of the most attractive cities of the Mediterranean, the center of contemporary cultural and tourist events with unique political and cultural history. After a long day of traveling for most, you will have a transfer to your hotel. Check-in and take the rest of the day to rest up and enjoy one of the most exquisite hotels in the area. Relax poolside, at the beach, in the spa or hit the gym. Today we will have a transfer to our boat in the afternoon. 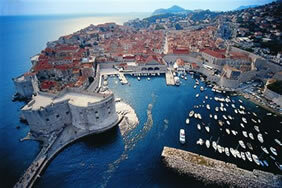 Once we check-in we will head out on a walking tour to discover Dubrovnik; founded more than 13 centuries ago. This old city is one of the most attractive cities of the Mediterranean, the center of contemporary cultural and tourist events with unique political and cultural history. Our welcome dinner will be enjoyed on board our home for the week and we will stay here overnight. After breakfast, we will set out to discover more of Dubrovnik – the Pearl of the Adriatic. 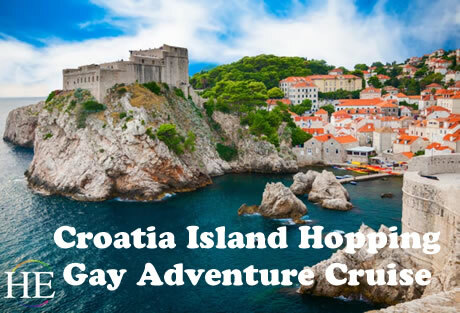 Lokrum Island will be one of our stops, which is a popular gay nudist beach. Here we will hit the water for some snorkeling and snacks. After lunch, we will have free time for sightseeing or enjoying some time at the beach. Today we will sail out to the hidden port of Pomena, on the Island of Mljet, located on the south of the Adriatic coast. This beautiful island is situated south of the Pelješac peninsula from which it is divided by the Mljet channel. It was discovered by ancient Greco-Roman geographers, who wrote the first records and descriptions around 6th century BC. After lunch we will explore a historical spot on Mljet, one of the islands “lost” at sea and not easily reached alone. Portions of this island are National Park, including the Big Lake, Small Lake, and Soline Bay. As we hike along pine-shaded paths we will come upon the island’s unique saltwater lakes where we will have time to jump in the water and float from one saltwater lake to the other via a cool waterway. The current will help you along, so no paddling necessary. 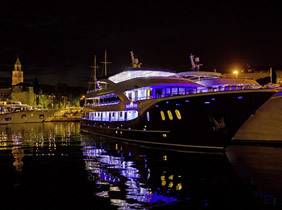 In the wee morning hours, we will set off for Hvar Island. This beautiful island lies between the islands of Brac and Korcula. 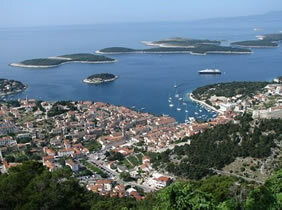 Hvar is located at the center of the Adriatic sailing routes. In the past, this has made the island an important base for trade throughout the wider Mediterranean area. After lunch on board, we will jump on our bicycles and head to a small interior island settlement. We will ride along a coastal gravel road from Jelsa towards Vrboska and then on an old road through vineyards towards Stari Grad. Stari Grad is one of Croatia’s oldest towns dating back to 384BC when it was a Greek colony called Faros. Once back in Jelsa, we will have time to explore the town and learn about its history as we will stay here for the evening. This morning we will take a swim at the most famous beach in Croatia, Zlatni Rat, known for its natural phenomenon horn shape. Located in the southern part of Brac Island, it is below the highest peak of all Adriatic islands, Vidova Gora, at 2559 feet. There are plenty of flat rocks to play froggie – the Croatian name for skipping rocks. After lunch, we will set sail for Split, Croatia’s second biggest city. Split is the administrative center of Middle Dalmatia and it is an important historical and cultural city, with numerous museums, churches, theatres and other archeological treasures. Perhaps the most impressive is the massive structure Diocletian’s Palace, built by the Romans in the fourth century. The palace and its many buildings inside were designated a UNESCO Heritage Site in 1979. We will have the opportunity to explore this ancient city and the Cellars of Diocletian’s Palace. This morning we will head to Korcula, best known as the birthplace of the famous explorer Marco Polo. 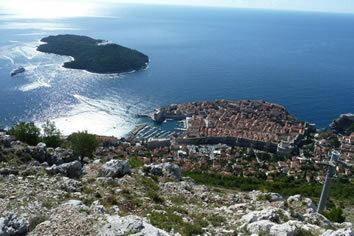 Within the fortifications and defensive walls, the red roofs extensively will remind you of Dubrovnik. View the centuries-old works of stonemasons whose architectural wonders created a very orderly urban plan. Enjoy a scenic afternoon walk through the Lumbarda countryside, passing olive groves & local vineyards. We will stop at some local wineries and sample some of the island’s finest traditional wines. After dinner, we will cap off the evening with a stroll through the vineyards of Lumbarda and enjoy a cocktail on the beach. Today we will sail by the biggest peninsula in Dalmatia, Peljesac Peninsula, known for its slopes that gave names to the best red wines, Postup and Dingac. These are produced from a small blue grape, which leads to the name plavac mali. On our journey today we will make a stop in the small town of Trstenik. Further down the Mljet Strait, we will come to the Elaphiti Archipelago, a group of 14 islands and islets. While taking in the views we will enjoy lunch and a swimming break. We will arrive in Slano this afternoon and tonight we will enjoy our farewell dinner. Today we will depart after breakfast and take in our final boat ride to Dubrovnik for our transfer to the airport. *The captain retains the right to modify the sailing route at any time. • Personal items including alcoholic beverages (when not with the group), snacks, laundry, and telephone calls. • Extra beverages onboard will be tallied throughout the week and you can pay before departing. This tour starts and ends in Dubrovnik, Croatia. The main daily activities involve swimming, snorkeling, kayaking, walking, cycling and relaxing on the boat. All activities are optional if you are not feeling up to them. You are welcome to spend that time instead exploring the island town that day or relaxing on the boat. What will the Cabin be Like? Your cabin will have a comfortable bed, a private bathroom, and air conditioning. Due to being on a boat with limited availability of resources, sheets will be changed out once during the cruise. Cleaning of the cabins and new towels will happen daily. The internet works well within most rooms and common areas. Cabin sizes are approximately 129 square feet; including the private bathroom. Is this a Private Charter? This cruise is not a private launch. There will possibly be a couple of other groups onboard with us for our journey. Even though it is only a 39 passenger boat, there are plenty of spaces to lounge on the top deck, on the back of the boat or in the air-conditioned bar or dining area. Our vessel for the week was built in 2018 by Ante Vukovic and is a luxurious motor yacht. There are 19 cabins and a sun deck(2690 sq. feet) with sun chairs a saloon, showers, and tables with benches. All cabins have individually controlled air conditioners, LCD TV’s, a safe and small desk, and WiFi. 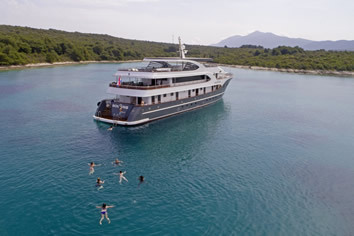 It has easy access to the sea for swimming from the stern platform which also has two showers for rinsing. Length 44 m, built in 2018. 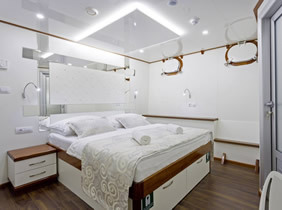 39 beds in 19 cabins with shower/toilet, individually controllable air conditioning, LCD-TV, safe and a small desk. 4 double cabins with queen-size bed, 4 twin cabins with separate beds which can be made up to double beds if desired. 2 double cabins with queen-size bed, 5 twin cabins with separate beds, 3 twin cabins with separate beds which can be made up to double beds if desired, 1 triple cabin with queen-size bed and a separate single bed. 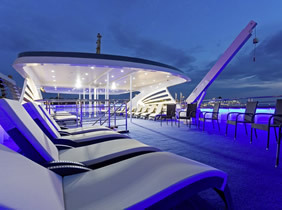 Sun deck (250 m²) with 40 sun loungers, bathing platform with showers at the stern. 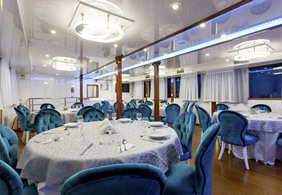 Saloon with air conditioning for 40 guests on the upper deck, tables with benches and chairs for 40 people on the covered upper deck behind the saloon. Depending on weather conditions, this part can be closed with a tarpaulin. Cabins are cleaned and towels are changed daily. Lower Deck Standard Cabin. Cruise/Tour Only. Upper Deck Cabin. Cruise/Tour Only.